Patch 1.23 removes the DRM. StarForce 4 DRM[Note 1] for Russian copies. Complete Edition; includes all three expansions. Neverwinter Nights 2: Complete is a complete edition with all three expansions. 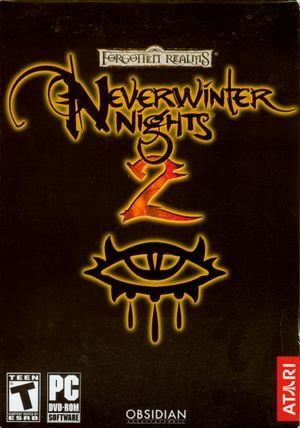 Neverwinter Nights 2 Platinum includes the Mask of the Betrayer and Storm of Zehir expansions. Only Off, Medium and High settings. EAX 3. Can be re-enabled with Creative Alchemy. Also supports Miles Fast2D. Mysteries of Westage is only available in English. No voice acting in DLC campaigns. Online play requires a CD key. GameSpy master server is offline; use the NWN2 Client Extension for a player-run replacement. Able to complete tutorial, but upon completion the game will not load the main campaigns. GameSpy GameSpy master server is offline; use the NWN2 Client Extension for a player-run replacement. ↑ 2.0 2.1 File/folder structure within this directory reflects the path(s) listed for Windows and/or Steam game data (use Wine regedit to access Windows registry paths). Games with Steam Cloud support may store data in ~/.steam/steam/userdata/<user-id>/2760/ in addition to or instead of this directory. The app ID (2760) may differ in some cases. Treat backslashes as forward slashes. See the glossary page for details.